FORT LAUDERDALE — The Ferretti Group opened its Fort Lauderdale International Boat Show Wednesday evening with a press event that touted the company&apos;s recent sales successes and push into new markets before ending with a surprise grand finale. Looking back at the last 12 months, several company leaders spoke about significantly reinforcing Ferretti’s commitment to the North American and Latin American markets and its continued emphasis on bringing new product to the marketplace. “We are developing 42 models right now, models that will debut from the end of 2011 through the end of 2013,” said Ferruccio Ross, country manager for North America. The Ferretti Group includes Bertram, Ferretti Yachts, Pershing, Itama, Riva, Mochi Craft, CRN and the Ferretti Custom Line. Connecticut-based industry veteran Kathy Kennedy was recently hired to handle market development in North America. Alton Herndon, president of Bertram Yacht, said he sees signs of hope on the sales front and that his company has built and sold 12 boats since Bertram’s 50th anniversary celebration, which was held at the end of April. He also said the “old inventory has been sold — that’s a big deal” and that two out-of-the-mold boats had entered the production line in the last two weeks. “We’re building boats,” he said to applause. The event ended with a “surprise” introduced by Ferretti Group founder and chairman Norberto Ferretti. 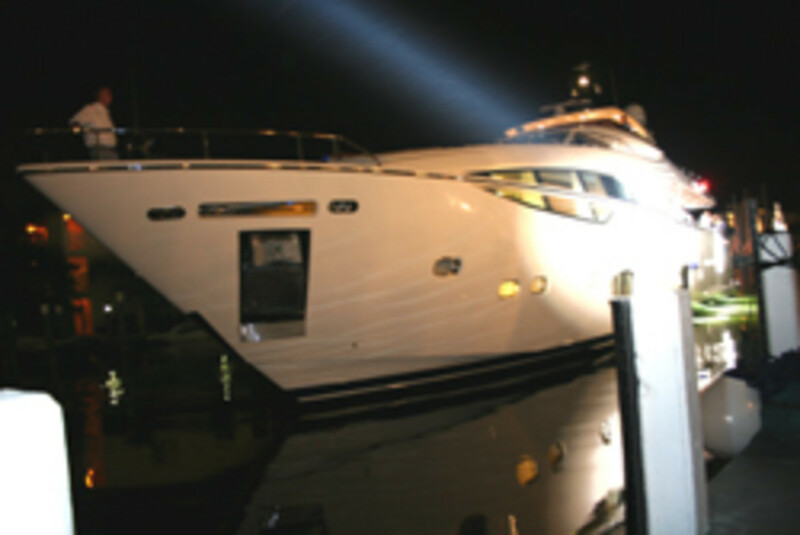 As he motioned toward the darkened canal that runs behind the Ferretti showroom on Southeast 16th Street, guests saw the world debut of the Ferretti Custom Line 100, which cruised into view at close range, lighted by a spotlight. The yacht is among five new vessels the group will display at the show. The group also touted the 20th anniversary of its presence in Brazil, the manufacturing facility that opened there last year and “encouraging signs” in countries such as the Dominican Republic, Panama and Peru.